Kelly Kettle camp stove for outdoor cooking and camping. 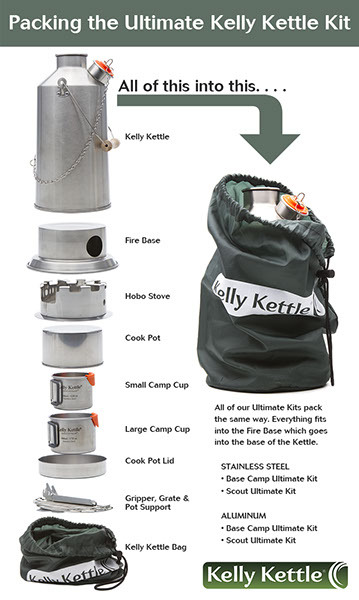 The Kelly Kettle Ultimate Kit! The top of the line, includes everything, leaving out nothing, so you can do it all, in the great outdoors – or your backyard. The good news is we employ genius designers at Kelly Kettle, so all these items fit right into the Kelly Kettle! Impressive. So you can take all the goodies to make coffee, cocoa, cook stews, soups, cereals, fry up some steaks and chops and roast some marshmallows for smores – all in one Kelly Kettle Ultimate Kit. And the best news – no need to buy, pack or litter with fuel canisters. Kelly Kelly uses all natural fuel; twigs, pine cones, dry grass. Whatever is available will burn and create a roaring little, but powerful, fire to boil water, cook food, and survive. Set these items in the bag, pull the bag up and cinch. Watch the quick video below to see how it all comes together. Pretty cool. If you’re not sure how all this amazing stuff works and what you use it for, check out our other videos and products at Kelly Kettle USA. We are pretty excited about our newest invention, the Hobo Stove. It’s like rocket science – only better. So have a look and see how one little piece of metal can change your life. At least your outdoor life, and really, what other life is there? Visit Kelly Kettle USA’s profile on Pinterest.